A probe from the Wenzel testing a gear. RONSON Gears will be promoting its recent installation of a state-of-the-art gear metrology machine, the Wenzel GearTec LH1010, Australia's first dedicated CNC gear measuring/coordinate measuring machine. The purchase of the revolutionary Wenzel GearTec, LH Gear CM technology brings a level of testing capability previously unknown in Australia. The generative gear measuring software is fast and precise. The introduction of a rotary table into the bed of this equipment not only enables high precision 3D, four-axis gear measurement, but also offers all capabilities of a CMM, providing Ronson Gears with an extremely versatile CNC measuring facility. 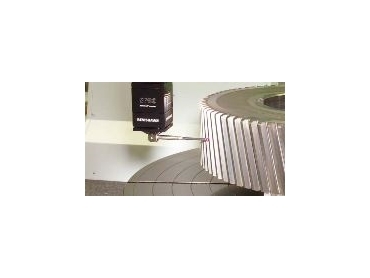 The gear measuring technology fully supports all gears manufactured to 1m diameter. Ronson Gears produces highly specialised gears for local rail, defence, mining, agriculture, printing, industrial gearbox manufacturers and special machinery industries, goods and services. These include components for the international auto industry and after-market automotive products, gears for heavy vehicles, and gear components for aircraft, trains and defence. Ronson Gears is at stand B60 in the Austech Pavilion at National Manufacturing Week 2005, in Melbourne, May 10-13.